"He was a young and little elephant, but not a baby elephant," begins this inspirational picture book, now available in digital from Oceanhouse Media. Based on the popular 2005 print title by Eric Drachman, Ellison the Elephant is the kind of storybook that has all the trappings of an instant classic. It's about an elephant named Ellison, who is having trouble finding his trumpet song. All he can manage is a little 'toot'. 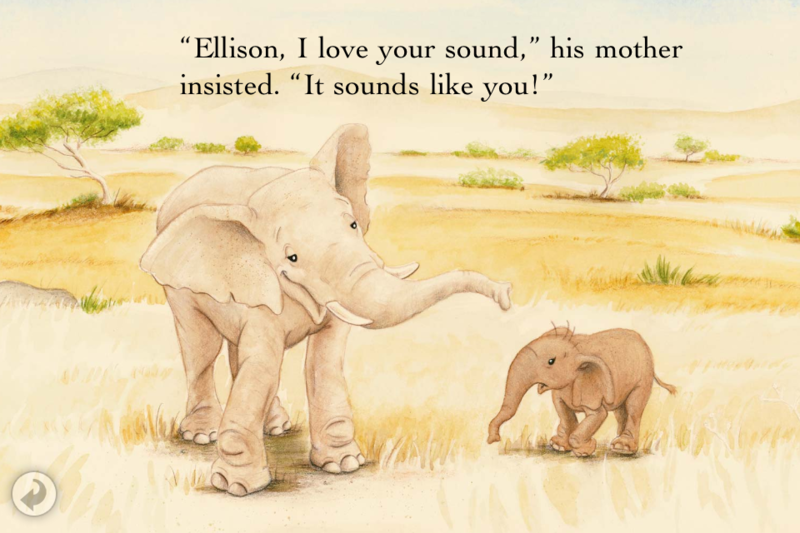 Of course, not only does little Ellison find his voice, but he also discovers that he is actually special, not 'less than' the other elephants. This is the real genius of Drachman stories, like Leo the Lightning Bug & A Frog Thing; they emphasize the ways in which an underdog can become the hero, usually through patience, perserverance and believing in themselves. These wonderful books make teaching the value of personal character much easier for parents & educators. Ultimately, this app does well because it features a well-crafted story and expressive original illustrations. It is also delightfully narrated, although the child voice-over for Ellison's dialogue sacrificies understandability for cuteness at times. Text highlights word-for-word with the polished voice-over, plus you can tap on any word to hear it again (or touch and hold over the text to hear it re-read). These features, common in omBooks from Oceanhouse Media, are great for reinforcing word recognition in young learner readers. One day Ellison meets a little weasel, who encourages him to explore the range of sounds he can make, adjusting the pitch and length of his utterances. Soon the sounds Ellison can make are not only pleasing, but downright jazzy. In the end, all the elphants dance in celebration of Ellison's amazing sound. Ellison isn't ordinary afterall ... he really is extraordinary!